The New Project Exploration Team, as the name suggests, is a department responsible for exploring new projects for next-generation materials. Our mission is to plant new seeds and nurture them until they sprout. We then leave the sprouts in the hands of the department, which conducts full-scale R&D and lets them blossom into flowers as our new projects. While each member of the New Project Exploration Team focuses on a different research topic, we all work under the same mission: to find new materials. 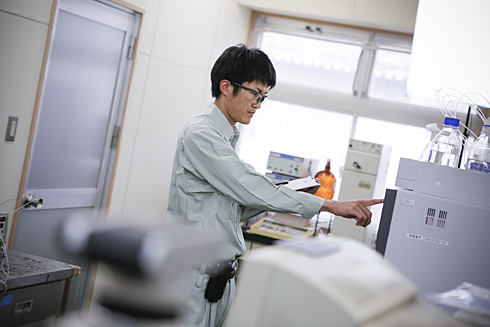 I am in charge of the research for applying and developing OLED materials as well as dyestuffs, which are our core technologies, and developing them into high-performance materials that will make people’s lives more comfortable. Sometimes, I participate in conferences to learn about the cutting-edge technologies in the industry or consult university professors or renowned industry experts to explore our original, new research projects. The most exciting thing about my work is that it keeps me in touch with cutting-edge technology. I am currently working on the development of new products of charge control agents (CCAs) for printer toners. 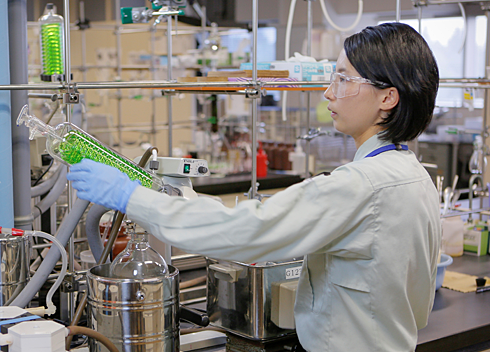 It involves synthesizing new compounds as well as examining how to improve the manufacturing processes of existing products to reduce costs, even by one yen, with the aim of providing better products at lower prices. Since development is closely related to manufacturing, I often visit manufacturing sites and accurately explain product formulas to plant operators. This is why it is crucial for us to work closely with plant engineers. Many people tend to think R&D staff conduct experiments day in and day out, but that is not the only thing that we do. When the products we have worked on are being manufactured, we go over to the manufacturing department to check the production status. If anything goes wrong, we quickly determine the root cause using analysis tools or other equipment. I find my work fulfilling because it allows me to be involved in the actual manufacturing process as well as the work on R&D projects to produce results. Copyright © Hodogaya Chemical Co., Ltd. All Rights Reserved.